MAKHTESH GADOL, ISRAEL–During the afternoon Yoav and I drove to the center of this magnificent erosional crater to visit familiar sites and do some preliminary surveys. It was deliciously hot and dry — just the way I like it. I concentrated on the middle of the Matmor Formation, a Jurassic (Callovian) unit of limestones and marls loaded with diverse fossils. I scoped out the sites I want to measure, describe and sample in the next few days. It was fun to see those places where several Wooster students did their Independent Study fieldwork over the years, and to make plans for the next set. Makhtesh Gadol looking from the Matmor Hills near the center to the north (N30.93458°, E34.97387°). The outcrop in the foreground has yielded wonderful fossils from the middle of the Matmor Formation. 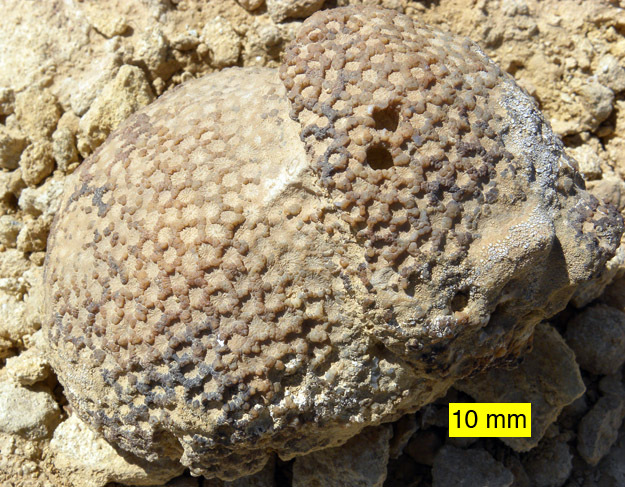 This is a fossil coral which was bored by bivalves while it rested on a Jurassic seafloor. You can see two of the boreholes clearly on the right. The coral shows compound growth. Apparently the lower one was shifted to a position almost at right angles from its original orientation, and then it budded off the capping portion on the right. MAKHTESH RAMON, ISRAEL–As part of a mine reclamation project in the Makhtesh Ramon National Park near Mitzpe Ramon, the ranger noticed large pieces of fossilized wood coming from the tailings of a bauxite mine which were being trucked to fill large excavations. Rather than bury these specimens forever, he called the Geological Survey to take a look. Yoav Avni, one of my Israeli colleagues and a good friend, took me there this morning to see the fossils and help remove them from the debris piles. 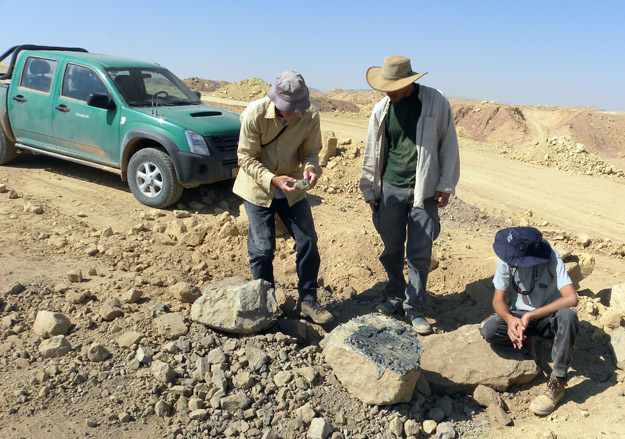 Examining pieces of Jurassic tree trunks with the Makhtesh Ramon ranger (center). The wood is from the lower part of the Ardon Formation, a Jurassic unit lying unconformably on Triassic sediments. The forest was on the equator during the Early Jurassic, which could make it significant. Most of the wood is coalified, with some patches of silicification. We’ll take samples to the Geological Survey headquarters in Jerusalem on Sunday to examine them more closely. This was a fun little detour because I’ve never seen Jurassic coal — nor had a front-end loader help me sort out specimens!